In his small office at the Johns Hopkins Bloomberg School of Public Health in Baltimore, Noel Rose, M.D., sits surrounded by stacks of books and papers—his groundbreaking lab research and the several textbooks he’s edited on autoimmune diseases. 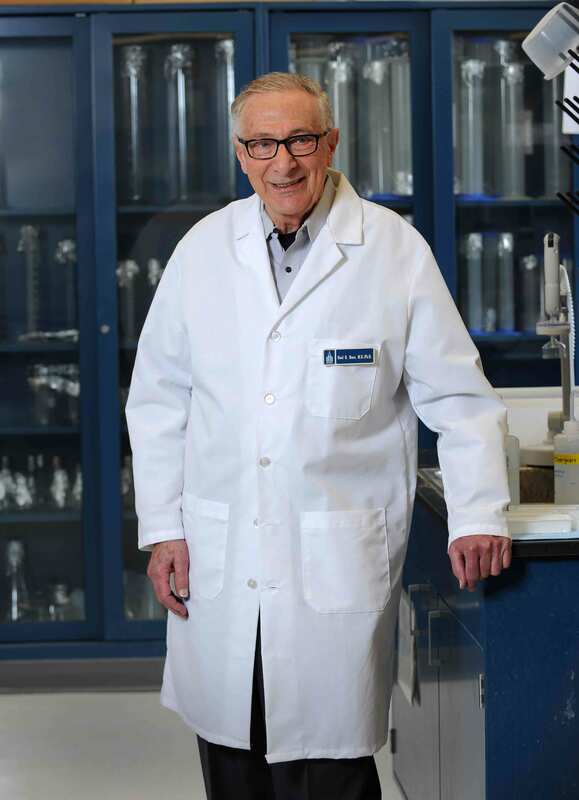 Rose, 87, known nationally as the “father of autoimmune disease,” is a giant in the field. But as director of Hopkins’ Autoimmune Disease Research Center, he has other work he takes just as seriously: answering calls for help from patients. For decades, he has gotten letters, emails and phone calls from people around the country with autoimmune problems like celiac disease. Many have been ill for several years and visited multiple physicians without getting any answers. Instead, because the symptoms can be vague, these patients are often labeled chronic complainers. “They want desperately to have some idea of what is wrong with them,” Rose says. Their struggle highlights the history of autoimmune diseases. This group of about 80 complex, often mysterious illnesses have, for a long time, defied easy diagnosis and treatment. Even the idea that a person’s own immune system could attack itself, something Rose showed in his research in the mid-1950s, was originally dismissed. And patients still face skepticism from physicians and families. For scientists researching celiac disease, it is a familiar refrain. When Alessio Fasano, M.D., came from Italy to the United States in the mid-1990s to study gastrointestinal disorders including celiac disease, other physicians scoffed. “We were told celiac disease did not exist [here],” recalls Fasano, the founder and director of the Center for Celiac Research and Treatment at Massachusetts General Hospital. He wound up proving that, in fact, the disease was as common in North America as in Europe. Still it would take years of study and work to get doctors to start recognizing the illness in their patients. “That was an epic battle we had to fight,” Fasano says. But celiac disease has something going for it that few other autoimmune diseases do: the trigger is known. And because of this and other factors, celiac disease research is shedding light on other autoimmune diseases, offering up intriguing clues as to how they work and how to stop them. “We’ve learned a lot from celiac disease,” says. E. William St. Clair, M.D., a professor of medicine and immunology at Duke University School of Medicine. St. Clair is also a leader in a national clinical research group called the Immune Tolerance Network, which studies autoimmune diseases and is sponsored by the National Institutes of Health (NIH). To a casual observer, the diseases grouped together as autoimmune seem strikingly different. They affect different systems in the body. Celiac disease affects the digestive tract, for instance, while lupus affects the kidneys, and multiple sclerosis, the central nervous system. But they also share common ground: all are caused by an immune response directed at the body of the patient himself. More than 20 million Americans—mostly women—suffer from the cascade of damage spawned by these diseases. An over-exuberant immune system can destroy cells or tissue. It can cause inflammation and damage, making organs malfunction. Tissues and organs can wind up permanently scarred. In addition to these immune responses, these diseases all have, to some degree, a genetic component. “More and more, it’s clear that the basic mechanisms that give rise to autoimmune disease are shared among different autoimmune diseases,” says Rose. He’s seen many advances in the understanding of the underlying genetics, but he thinks trying to alter the genes to stop or treat autoimmune disease would be difficult. To really do something about autoimmune diseases, Rose notes, scientists must figure out the trigger. With the exception of celiac disease (and in rare cases of scleroderma, which can be triggered by silica, or ground glass), scientists don’t know the triggers for autoimmune diseases. They theorize that bacteria, viruses or toxins could be involved. But in a person with celiac disease, the known trigger is gluten. When a patient eats gluten—a protein found in wheat, rye and barley—the body mounts an immune response that attacks the small intestine. This causes damage that makes it hard for the body to absorb nutrients, leading to problems such as fatigue, weight loss and chronic diarrhea. Long term those who have celiac disease can develop other medical conditions such as anemia and multiple sclerosis. The fact that gluten is the trigger, and that removing it from the diet stops the symptoms, helped establish the concept of a trigger antigen, or, in some cases, an “autoantigen.” The autoantigen is the substance that is part of cells, be it a protein or nucleic acid, that provokes the immune response that then causes problems. Knowing the trigger has also helped reveal how complex this mechanism is. Annette Rothermel, M.D., program officer in the autoimmunity and mucosal immunology branch at the National Institute of Allergy and Infectious Diseases, says that through celiac disease, researchers have been able to see how the immune system processes the gluten, how it is recognized, and then how the immune system is activated. He believes that celiac disease research may demonstrate another crucial theory for autoimmune diseases: that it’s not a simple matter of having a genetic predisposition and being exposed to the trigger. “It is not destiny,” notes Fasano. “Whether you develop the disease or not depends on so many other factors.” He believes those factors come from the environment. Take, for example, the person who has a genetic predisposition to celiac disease, but doesn’t develop it, even though he or she is eating gluten. This happens in some people, who may go years eating gluten without experiencing any symptoms. But at some point, when they are older, something happens, and they develop celiac disease. Fasano believes the explanation may lie in what’s known as the microbiome—the collective genome of all the microbes, such as bacteria, in and on the human body. These bacteria on the skin and in the gut, our internal environment, are important factors in the disease. Fluctuations in these microbes can affect, among other things, the gut integrity, the metabolism and the immune response. That may cause the genes—which have been there all along, not causing a problem—to be turned on. He compares it to the case of Type 1 diabetes, which used to be known as juvenile diabetes, because it was always diagnosed in children. Now, however, adults are turning up with Type 1 diabetes—presumably because of exposure to something. To study this, Fasano and other investigators are now enrolling infants at risk for celiac disease in a major study. Researchers will follow the babies through the first 10 years of their lives. The plan is to track how the microbiome changes and which genes are turned on over time. Fasano’s team will also study what other factors contribute to the development of the disease. The bacteria in the gut also seem to be playing a role in rheumatoid arthritis, notes Hopkins’ Rose, and he is studying whether the microbiome is also involved in myocarditis, an inflammation of the heart muscle often caused by an autoimmune reaction. All of this is crucial for families, who know that if one member has an autoimmune disease, other relatives are at higher risk for developing one. The diseases often cluster within families. For example Virginia Ladd, an autoimmune disease patient advocate who has 13 siblings, can count several with Crohn’s disease, three or four with lupus, and a few with celiac disease. Celiac disease patients have an increased chance of developing autoimmune diseases such as autoimmune thyroid disease, pernicious anemia, autoimmune hepatitis, sarcoidosis, scleroderma and psoriasis. There is also a connection between celiac disease and Type 1 diabetes, with the prevalence of celiac disease in patients with Type 1 diabetes estimated at about 8 percent compared to about 1 percent in the general population. Many patients wonder whether sticking to the gluten-free diet will lower their risk of developing these diseases. But researchers say that, at this point, there is no evidence hat is the case. Doctors do know that a skin condition that is a manifestation of celiac disease—an itchy skin rash called dermatitis herpetiformis—often improves on the gluten-free diet. Curiously, only a small number of patients with dermatitis herpetiformis have even mild gastrointestinal symptoms, despite the fact that they have celiac disease, and therefore have the immune response in the gut that is seen in celiac disease. It’s a mystery why some patients develop the skin inflammation, while others get the gastrointestinal symptoms. Researchers suspect the secret may lie in a certain type of antibody, IgA, produced in the gut, which reaches the circulation and accumulates in the skin. What gives hope to many are the biological drugs that have come on the market in the past several years for some autoimmune diseases. These medicines target particular proteins to calm down the immune response, and they’ve been a breakthrough for rheumatoid arthritis patients—and have also helped in other autoimmune diseases, such as Crohn’s disease. Several drugs for celiac disease are in advanced stages of study, though as yet none are on the market. St. Clair looks to the example of cancer researchers, who figured out that there were sub-types of breast cancer and discovered a treatment that only worked in a certain sub-type. Many autoimmune diseases can also be broken up into subgroups, and St. Clair e envisions this type of “precision medicine” coming to autoimmune diseases in the next five to 10 years. But at this point, absent any new discoveries, doctors doubt that looking at subgroups in celiac disease will be that fruitful. Patients who don’t respond to the gluten-free diet are divided into two small subgroups, but in total they only account for about 1 percent of those who are diagnosed with celiac disease. Plus they don’t have any genetic or antibody differences, as researchers might see in subgroups of patients with, for example, rheumatoid arthritis. In any case, getting patients with autoimmune diseases into clinical trials can be difficult. Some of the illnesses affect a smaller number of people, so there is a smaller pool to draw from. Moreover because they’re mostly chronic conditions, once patients get symptoms under control, they are wary of doing anything that they fear might change that, says Ladd, who is the founder and president of the American Autoimmune Related Diseases Association. Her group is putting together the Autoimmune Research Registry Network to help researchers identify patients who could participate in studies. The Celiac Disease Foundation (CDF), a California-based national celiac disease advocacy group, is participating. The foundation is also joining forces with another research network that will allow celiac disease patients to input information about other medical conditions, such as other autoimmune illnesses. That would help scientists see the big picture in terms of the connections among these diseases. What’s appealing about these projects, which together will be called the National Celiac Disease Network, is that patients can decide how much information they want to provide and to what degree they’re willing to share it, says Marilyn G. Geller, chief executive officer of CDF. Researchers won’t have access to any private information unless, after being contacted by CDF, the patient decides to participate. It’s an easy way to make a difference. “Right now patients with celiac disease have little power in terms of shaping the future of their disease,” Geller says, noting that this registry should help boost the number of studies done and therefore increase awareness and ultimately research funding. Nationwide it’s becoming a bigger concern, as studies have found the number of people with celiac disease, multiple sclerosis, Crohn’s disease and other autoimmune diseases is growing, in some cases at striking rates. Some of this may be increased detection, but researchers believe something else is driving it. Some look to the “hygiene hypothesis,” which postulates that better sanitary conditions have reduced our exposure to microbes and infections. This may change the development of the immune system and skew it toward the development of autoimmunity. Others believe the blame may lie in auto emissions, pesticides or something else in the environment. For Rose, who has seen so much of this play out over his long career, it is worrying. And his weekly ritual of answering the patients who are looking for help hasn’t changed. He sits down and calls or writes each one, trying to explain what might be going on in their bodies, and what scientists know and don’t know. He refers them to the specialists who might be able to help. And in the cases where no one knows the answer, he advises a simple path: find a primary care physician who is sympathetic. The rest of his week, when he’s in his lab, doing research, he likes to imagine another world, one where these patients would be identified early and given some treatment, before they ever get sick. Diana K. Sugg is a freelance writer and editor based in Baltimore. She was a veteran medical reporter at The Baltimore Sun, where she won the 2003 Pulitzer Prize for beat reporting. Want first access to celiac disease articles and news?